The terrorist planned for everything, except for one small town sheriff, Mathew McKenna. Sheriff McKenna is visiting his niece when he suddenly finds himself in the middle of the worst terrorist attack in history. McKenna will need all his strength, and everything that he is, to save the lives of those around him. If he fails, then millions of people who call the city of Liberty their home will die. Washington is in crises. What can they do? Should they implement the Twenty-Fifth Amendment of the Constitution of the United States making the Vice President the Acting President? Liberty, the first orbital city, is having its 10 year anniversary party! The President of the United States and his family will be attending. Washington watches in horror as the terrorist attack unfolds. Washington looks to McKenna. He is their last hope. Join sheriff McKenna and an amazing cast of characters in this gripping thriller as they fight for Liberty, for each other, and fight for their lives. I remember when I was a kid, and I used to sneak into my big brother’s room and grab his ‘Tarzan’ and ‘John Carter of Mars’ paperbacks when he wasn’t looking. And I still remember the experience of discovering that I wasn’t as sneaky as I thought I was. I still remember the joy of reading ‘A Wrinkle in Time’ and ‘The Hobbit’. I enjoy all sorts of books from all kinds of genres. Almost all the fiction books that I read are thrillers, or some kind of adventure. I tried to write my first book when I was elementary school, and again in junior high school. 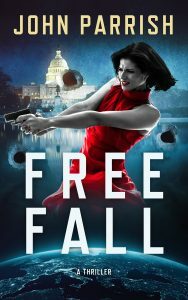 I hope that everyone who reads ‘Free Fall’, my first adventure, enjoys the ride.